Two years ago my family and I were getting ready to leave our “extended stay vacation” home in Warren, New Jersey, as I liked to call it. Click here for more photos: July 4th, 2016. Visit the post from the beginning of this blog! Today, we are back home in Littleton, Colorado. We are getting ready to launch a very exciting TLC Squared initiative, Confessions of a Mother’s Heart (COMH-Unity) Support Group(s) this fall. In conjunction with COMH-Unity groups I’m also launching my first book, “Confessions of a Mother’s Heart – Blogs, Volume 1”, which will be placed in a limited number of Home Care Kits every year. The book will be coming out in the next month or so and will be available through Amazon. Be on the lookout for my next blog post with more details. What have you been up to? Have any exciting move coming up that will also be life changing? I would love to hear about it! Hope you are having a safe and memorable July 4th Holiday. Enjoy the freedom we have in America responsibly! What’s up with me and TLC Squared? Wow, it’s been too long since I have written to you! So, “what’s up” with me and TLC Squared? I was very busily finishing our homeschooling for the year. My oldest daughter finished 10th grade, my middle daughter completed 7th and my youngest ended her elementary years in 5th! This year all my girls were able to participate in International Towne together. That was a very intense experience! We had to prepare for the one day event many weeks before. After all was said and done, even though none of them were very enthusiastic about doing it, we all enjoyed the day very much. They all commented that they would do it all over again, knowing what to expect now! I can confidently say that my girls finished school “best in their class”! But, they are the only students in their class ;-). Since February my husband and I, along with our Advisory team, were busily planning for the first Fundraiser and Luncheon to Raise Positive Awareness of Perinatal Mood and Anxiety Disorders that happened on May 5th, 2018. I have a great team of of men, women and even (my) children, consisting of my faithful husband, a church family friend (executive chef) and his awesome wife, and three other wonderful and dedicated women of faith who advised me and worked with me to put it all together. Here is a link to the NEW TLC Squared Facebook with pictures and Live events of the May 5th, 2018 event. First Luncheon and Fundraiser Event pics! Facebook Live event right after the Luncheon! We had a great turnout for our first event, thankfully. There were a little over fifty people! On May 4th, just a night before our big event, our family dog, Ezra was showing signs of illness. He was vomiting a lot and not eating at all, which is NOT normal for this big guy. We naturally became concerned about him. So, the next day, the morning of an already busy day, my husband, Troy took him to the vet very early. Ezra had swallowed too much his favorite toy (leather football) and he ended up getting a lot of it stuck in his stomach. Talk about an emotional roller coaster! While the luncheon was going on my husband was giving me updates in between the silent auction and lunch. We did finally figure out how we could pay for his very costly surgery, temporarily, and save his life. But, it was at the cost of our three girls’ college funds. So, here is the link to the GOFUNDME page IF you want to help them restore it. They all willingly said yes to using their money to give Ezra a second chance at life with them. Our dog is also a family member and nobody, especially our girls, wanted to see him die this soon. He’s only 5 years old. 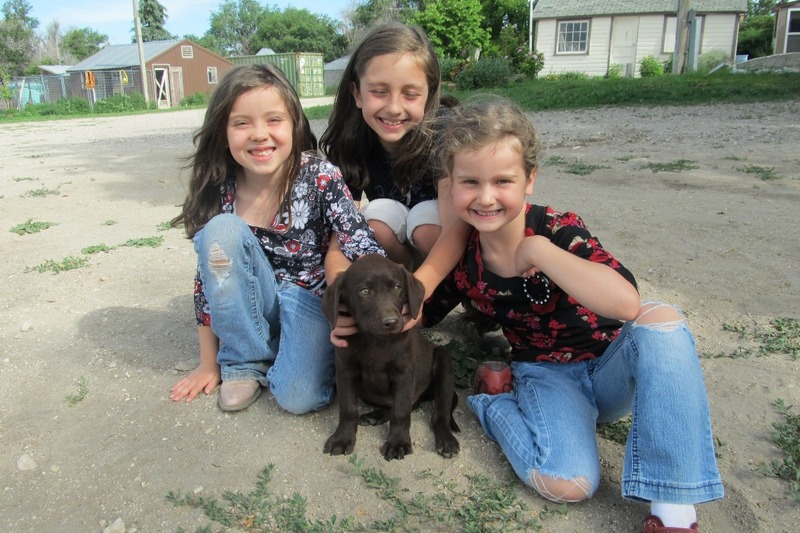 Here are our girls pictured with Ezra when we first adopted him in June of 2013. 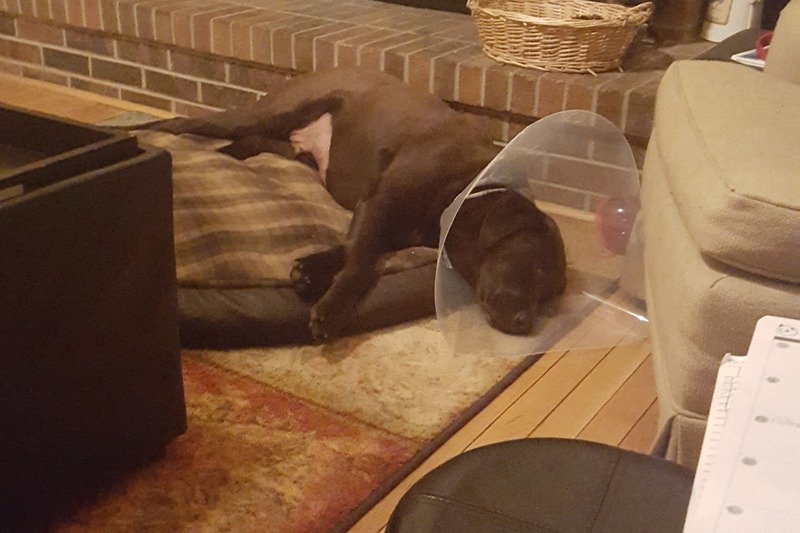 Here is Ezra after coming home from his surgery after May 6th, 2018 . Two weeks after the luncheon I produced another Facebook live event which talks about what I learned and a little bit of what Dr. Stephen M. Scott, Associate Professor, Ob/Gyn & OB Health at Colorado University School of Medicine shared at the event. This video helps the viewer identify what Postpartum Depression and Anxiety are and where to get help, if needed. Please watch and share it with anyone you know or suspect might need it! The last thing that I have been working on, as much as possible, is my first book. I’m still putting on the finishing touches and I hope to have it self-published and made readily available for purchase by July 4th! I can’t make any promises as to when I will write again, but my hope is that it will be in the next month. I have come to realize that I cannot do everything I want to do. I must do what is most important for my God and my family. That means that I must make sure my family has what they need to live, like clean laundry, some healthier meals, and a mostly mentally and physically healthy and sound Mama! My husband has been very supportive of my endeavors, but I must not test him too much. He deserves better! I want to give my girls a healthier model of what it means to be a Christian woman, mom and supportive wife to their dad, while trying to pursue my (God given) hearts desire’s to love and serve others, not only my immediate family. I let my girls to see me mad, sad and very glad…Well I don’t always have Christ-like self-control. I want my girls to see that life in this world is not going to give you the perfect conditions in which to live, but God has made it possible to live in this world with the hope that whatever is happening, as the result of my own fault or of any hard work I produce, He will work it all together for my good (Romans 8:28). Finally, it seems like it’s raining too much, but not physical rain. Maybe I shouldn’t be pursuing so much outside my home duties? Maybe no one really cares and I’m wasting my time…NO, I must remain Steadfast…this too will soon pass! My word for the year has definitely been tested! So, I must remain steadfast if I want to leave a legacy…but it’s going to take some blood, sweat and tears! In the meantime though, I’m going to try to not worry and enjoy the summer with as many outdoor excursions and family making memories as providence allows. SO, go out and try to do the same because we are not promised tomorrow, only the “present”…open it up and make the most of it! DOES ANY of this resonate with you! Please let me know! I really do want to know how you are doing. When I last wrote to you, I had accomplished one of my main 2017 goals by starting and then telling you about the new nonprofit organization, TLC Squared. Now I’m going to try to explain how scared I was of even moving forward with it and how it is surprisingly moving along. In 2016 I was not very confident in what God was speaking into my heart. I had many doubts. “Will this work out? Will my husband be on the same page as me and my vision for this ministry? Will there be ANY women interested in coming along side to work towards the common goal that is commanded in Titus 2:5-8? Where is the seed fund for this ministry coming from? How will I ever do this well while raising our three growing girls and educating them from our home base? And, on and on the list continued. Despite these fears and doubts, I felt supernaturally empowered and confident in my God, who is greater than all these things, to believe He has a plan for TLC Squared and the ministry initiatives already occurring ( Tea ‘n Talk, Ladies Time-Out , Confessions of a Mother’s Heart and the Home Care Kits for women and new babies). How could I, a mostly unimportant, stay-at-home, postpartum depression recovered, home educating mom ever do this? I might not be very confident in what my place is in this world or of the ever changing political, social, and economic status of this country, but I am most passionately convinced of the one constant in my life; the one true and Living Word of God, Jesus Christ! There was only one way TLC Squared Ministries could take off and make a difference in the local community and prayerfully, in the world. That was through the power of the living, breathing and active Word of a loving God’s Spirit! I don’t believe in myself, my abilities, or disabilities to make an eternal difference in people’s lives. I NEED something or someone bigger than me to believe in, in order to accomplish something supernatural. I chose to believe that God is bigger than my fears and doubts! I chose to believe in the unchanging Word that helps keep me focused, especially when I’m feeling weak in flesh and spirit. At TLC Squared our goal is to fulfill the Titus 2:5-8 command and to share the Love of Christ in order to ”Re-create Homes One Family at a Time via Teaching, Loving and Connecting” people. So what is next for TLC Squared? Only God knows, but for now I can say that I’m looking forward to continuing to lead monthly Ladies Time-Out’s; presenting Tea ‘n Talks at Natural Grocers, Senior Centers and mom’s groups; handing out Home Care Kits this spring; and hosting Confessions of a Mother’s Heart Ministry events as part of my personal ministry, www.Socorrogill.com in Denver, CO beginning this fall. If this is something you would like to get involved with, please let me know. I’m building a team of women who have a heart for helping families grow strong in Christ by fulfilling the Titus 2:5-8 command. I would love to hear how you can come along side this new ministry to families. Go to www.TLCsquared.org and contact me to set up a time to talk! Would you consider giving a one-time financial gift to the seed fund? Go to https://www.aplos.com/aws/give/acn/tlc-squared to donate! Next month I plan on giving you more details on the growth and happenings of this ministry and sharing some insights for living as a woman of God in 2018. What did you do last year to make a difference in your family, friendships or community that you are continuing to build upon in 2018? Have you heard of “mindfulness”? I was first introduced to the concept of mindfulness last year (2016) in New Jersey. It was a part of a series of personal phone coaching sessions required by our health insurance, through Troy’s company, in order to receive a special discount. Last year around the same time in the spring I was experiencing the physical ramifications of spiritual and emotional turmoil as a result of sin in my life. It wasn’t a coincidence to me that while this coaching session was meant to make me mindful of my food choices and eating habits, God was using it to make me more aware of my spiritual temperature and spiritual habits. “Being Mindful” – It’s thinking about what you’re doing versus mindless (becoming self-aware). Have other alternatives, which are not as bad, then eliminate those eventually. Discussed food groups: Bake or Broil, or BBQ your meat to allow fat to drip off. Think about activity you’re doing and how many minutes it takes to do those things. Moment to pause – To become aware of your “breathing”; helps your mind to be in tune to what your body is doing. “Be mindful” of the whole foods versus processed food you eat. Writing the notes I started realizing what God was speaking to me personally. Just as I was told to take in more whole physical foods, I came to the conclusion I needed to spend even more time in the pure Word of God, instead of participating in mostly topical bible studies. Am I spending time in “quiet” time to focus on breathing deeply, listening to the “breath” or Spirit of God? Am I in tune with God’s Spirit as much as I am “tuned in” to the physical world? What one thing can I do today to be more spiritually in tune with God? I told myself, “Work on at least one new thing a week until you are fully aware of your need for, not only physical food, but the Word of God to feed your soul! It was easy to admit that my dietary choices weren’t always the best, but it was eye opening to apply the Mindfulness principle to what God was convicting me about. It made me more aware of how much God loves me. If I hadn’t taken the time to listen to God’s voice in the midst of this mundane and required coaching session for my physical well-being, I might have missed what He had for me to “digest” and get nutrition for my soul, which will last longer than my physical body. Today, as I write this and share my heart with you, it’s my desire that you too will take a moment to be mindful of what God is speaking into your heart. While driving to and from your home or playing at the park, be mindful! I had a very rough month since I wrote to you last. You will hear more about it as the wounds heal and as people are ready to share. In the meantime I wanted to give you something to chew on (pun intended!) so that you, like me, may have the courage to share hard things with others when it is more difficult. What draws others to God in us is not the accusatory remarks, but the extended arms of love and acceptance. God draws people to himself through the sacrifice of His Son, Jesus, dying on the cross for us. It is my hope that you may see God in my family and me, not because it sometimes looks like we may have any “easy” life, but because in the midst of our struggles we hang on to God with all our strength. This is the time to be mindful of the promises of God. So whatever you are going through right now, devastating news of a loved one with cancer, shocking news of abuse in the family, or the unexpected divorce of an unexpected couple, hang on to God’s promises because they will never let you down! When life gives you manure and dirt, give it back to God so he may place it in the garden of your heart’s home, where through the breath of His spirit, you may experience true life, and grow deep and rooted in His love, and eventually bear the fruit of His love for you and your love for others.